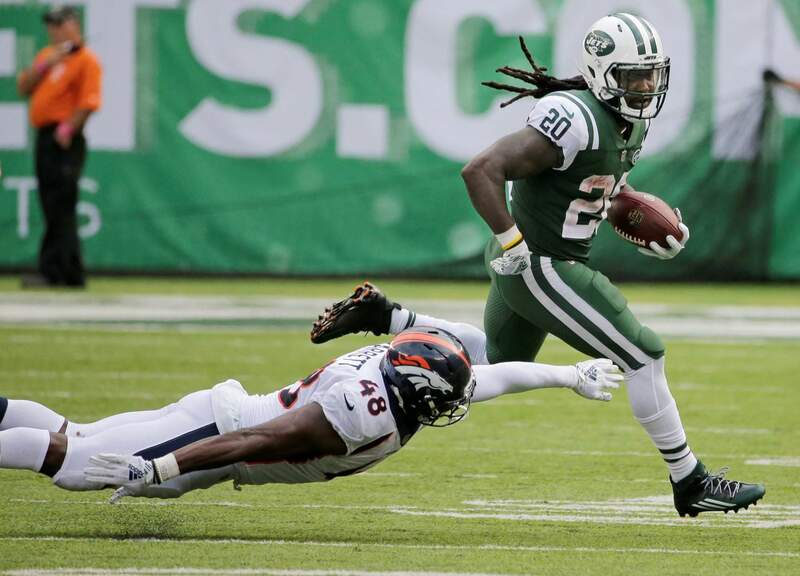 New York Jets’ Isaiah Crowell runs away from Denver Broncos’ Shaquil Barrett Sunday in East Rutherford, N.J. The Broncos lost the game, 34-16. 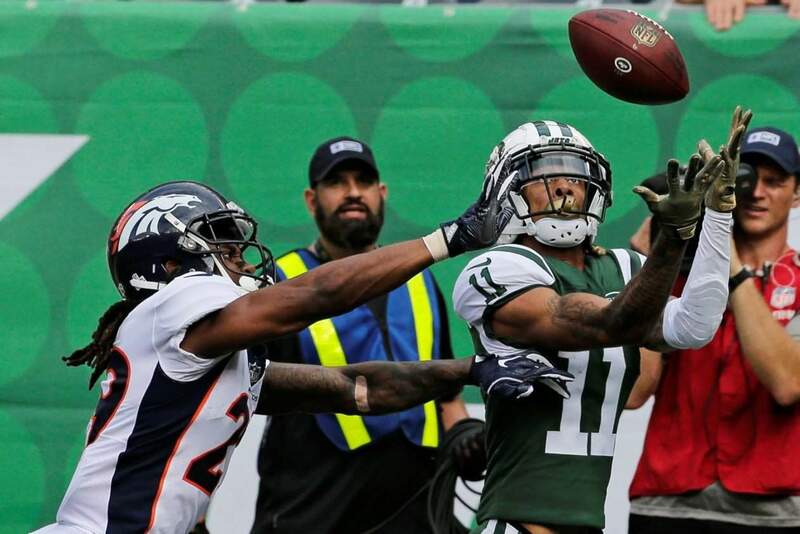 New York Jets’ Robby Anderson catches a pass in front of Denver Broncos’ Bradley Roby for a touchdown Sunday in East Rutherford, N.J.
Denver Broncos’ Courtland Sutton catches a pass for a touchdown Sunday in East Rutherford, N.J.
Denver Broncos’ Case Keenum reacts as he is sacked by New York Jets’ Leonard Williams during the second half Sunday in East Rutherford, N.J.
EAST RUTHERFORD, N.J. – Isaiah Crowell ran for a franchise-record 219 yards, including a 77-yard touchdown, and Sam Darnold threw two TD passes to Robby Anderson, including a 76-yarder, to help the big-play New York Jets snap a three-game losing streak with a 34-16 victory over the Denver Broncos on Sunday. Darnold also had a TD toss to Terrelle Pryor that sealed the game late in the fourth quarter for the Jets (2-3). The rookie quarterback finished 10-of-22 for 198 yards and three scores with an interception to help New York to its first win since the season opener. Crowell needed just 15 carries to break the team record of 210 yards rushing set by Thomas Jones in 2009 against Buffalo. New York finished with 323 yards rushing and 512 overall yards. The Jets’ defense came up big, too, while playing without coordinator Kacy Rodgers, who is dealing with what coach Todd Bowles has called a “serious” illness. 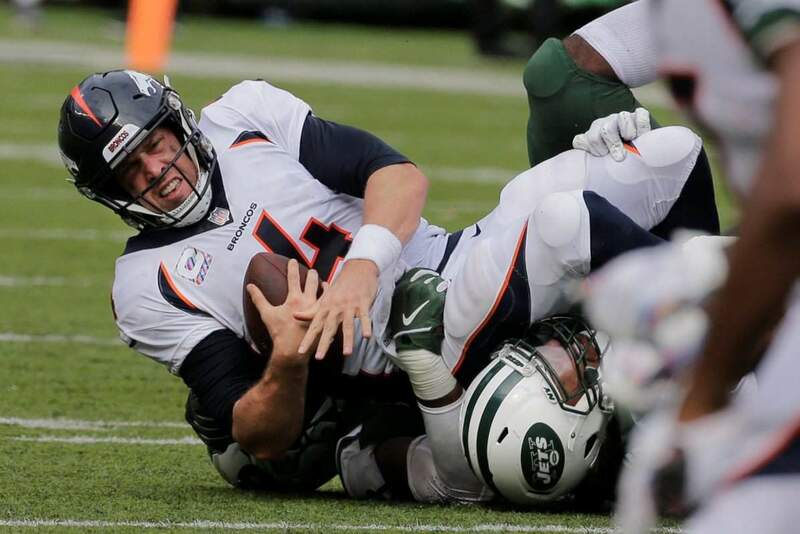 Bowles ran the defense against the Broncos and the Jets kept the pressure on Keenum all game, sacking him four times – including two by Leonard Williams. They nearly had one more big play when Marcus Maye intercepted Keenum’s final pass and returned it 104 yards before being taken down by Courtland Sutton at the 1 to end the game. Keenum finished 35 of 51 for 377 yards with touchdown passes to Sutton and Demaryius Thomas for the Broncos (2-3). It was big plays on offense that powered the Jets to the victory. They got things started right after an ugly 20-yard punt early in the second quarter by Colby Wadman, who replaced the injured Marquette King. Crowell took the handoff, scooted to the left sideline and zipped into the end zone – getting some nice blocks from receivers Anderson, Pryor and Jermaine Kearse along the way – for a 77-yard yard touchdown. After being fined $13,369 by the NFL for his crude TD celebration two weeks ago in Cleveland, Crowell simply tossed the ball to the turf in the end zone. The Jets were just getting started with big plays. On their next possession, Darnold found Anderson streaking down the field uncovered and connected for a 76-yard touchdown that put New York ahead 14-7 with 10:46 left in the half. It was the longest TD catch of Anderson’s career. According to the Jets, it was the first time they have had multiple TDs on offense of 75 yards or more in the same game since Sept. 24, 1972, against the Baltimore Colts. Joe Namath tossed TD passes of 79 and 80 yards to Rich Caster in that one. SLOW STARTThe Jets turned the ball over on their second play from scrimmage when Adam Gotsis knocked the ball out of Powell’s hands and recovered at New York’s 20. Three plays later, Keenum found Sutton in the end zone from 8 yards out to give Denver a 7-0 lead. It was Keenum’s first TD pass since Week 1, when he had three in a win over Seattle, and the first touchdown reception of Sutton’s career. 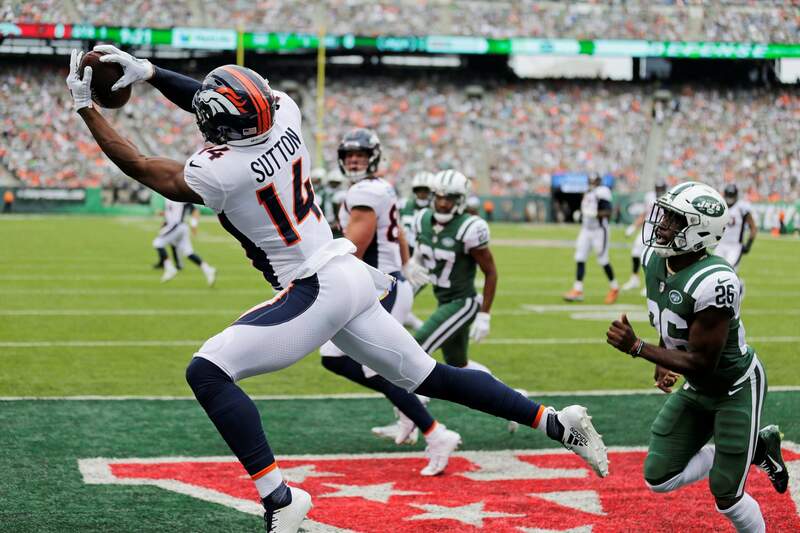 STORMING BACKKeenum completed passes of 31 yards to Thomas and 24 to DaeSean Hamilton to put the Broncos at the Jets 7, but New York came up with a red-zone stop and held Denver to a 30-yard field goal by Brandon McManus to make it 14-10 with 3:58 left in the half. On New York’s next possession, Darnold reared back from the 35 and fired a perfectly placed pass into the left corner of the end zone, where it dropped into Anderson’s hands just beyond a pursuing Bradley Roby for another touchdown. Myers made up for an earlier miss on a 30-yarder by kicking a 49-yarder that gave the Jets a 24-10 lead with 4:52 left in the third quarter. He kicked a 30-yarder in the fourth, set up by Andre Roberts’ 51-yard punt return. INJURIESJets: CB Buster Skrine left in the first quarter with a head injury and didn’t return. Skrine started in place of Trumaine Johnson, who was sidelined with a strained quadriceps. Broncos: CB Adam Jones was ruled out in the second half after injuring a leg. UP NEXTBroncos: home vs. Los Angeles Rams next Sunday. Jets: home vs. Indianapolis Colts next Sunday.